At Downriver ENT, P.C., we understand that the health of your child is a top priority. You want them to be happy and feeling great every day of the year. Unfortunately, kids inevitably get sick and sometimes the symptoms aren’t immediately apparent. 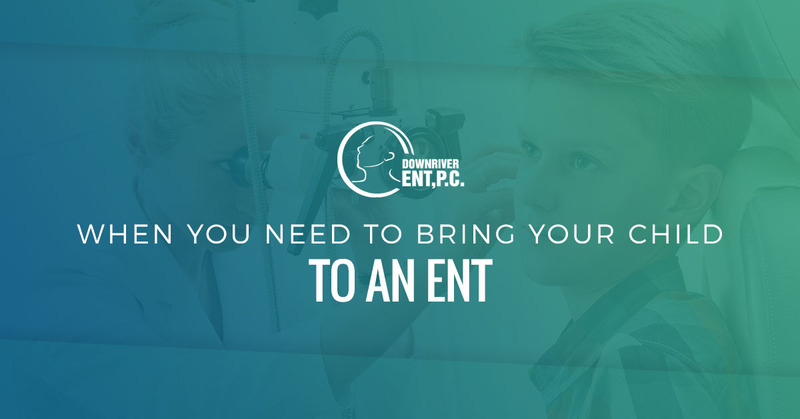 In this blog post, we’ll provide you with a few of the most common issues that children suffer that indicates that they need to visit our pediatric ENT specialist in Southfield. If you’ve noticed any of the following, make sure to contact us today to schedule an appointment today! As any parent knows, nosebleeds are a common occurrence as a child grows up. From countless falls, nose picking, and even sticking Legos, cereal, and other small items right up their nostrils — nosebleeds are bound to happen. However, if your child is having persistent nosebleeds, such as two to three times a week, this is likely due to something other than their curious and clumsy nature. It’s possible that their nasal passages are inflamed, or even a deviated septum. 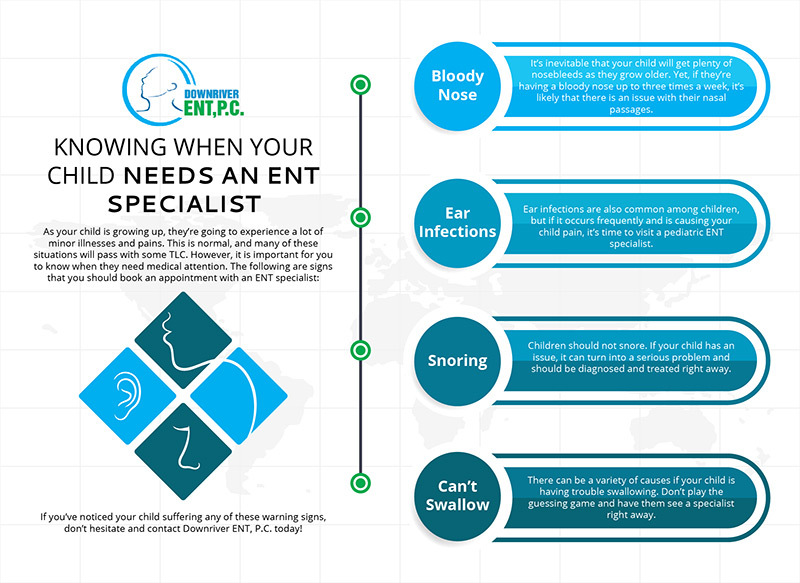 No matter the issue, our ENT specialist will diagnose the problem and provide them with the treatment that they need. While many adults suffer from snoring issues, children should not. If you’ve been noticing your child snoring throughout the night, then something is wrong. Not only will they have trouble sleeping, but it means they’re not breathing correctly during their sleep. While it might be a little bit cute to see your young one snore, it is actually dangerous and a strong indication that you need to contact an ENT specialist. It may be a simple problem such as allergies, or something more severe like sleep apnea. Either way, contact us now! If your child has been having throat issues, and are having troubles swallowing, even liquids, this is not only uncomfortable for them but damaging to their health as well. There are multiple issues that could cause them to have problems swallowing, and we’re here to figure out the root cause so that we can get them back to full health again. Other problems could be repeat sinus infections as well as strep throat. So if you’ve noticed any of the aforementioned symptoms in your child, make an appointment with our pediatric ENT specialist in Southfield as soon as possible so that we can get them back to their happy and healthy selves.